The perfect hue for a special summer birthday. 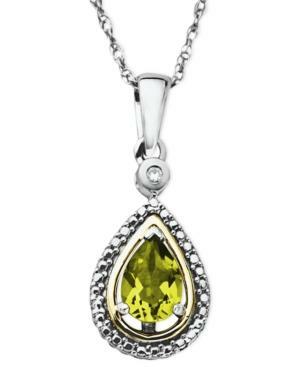 August's birthstone is the peridot, and this teardrop-shaped gemstone (3/4 ct. t.w.) really makes a statement. Crafted in sterling silver and 14k gold setting with a sparkling diamond accent. Approximate length: 18 inches. Approximate drop: 1 inch.